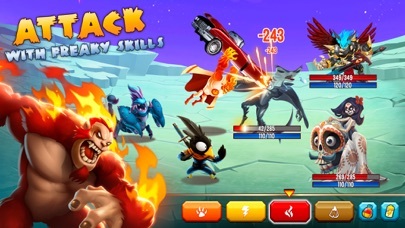 Battle with the ultimate monster fighting force to lead them to victory in Monster Legends! Breed, feed, raise and train legendary monsters and turn them into beasts! 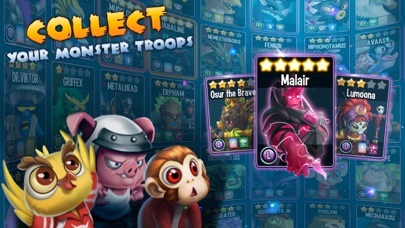 Collect mighty monsters to uncover unique skills and boost your strategy in action packed battles. 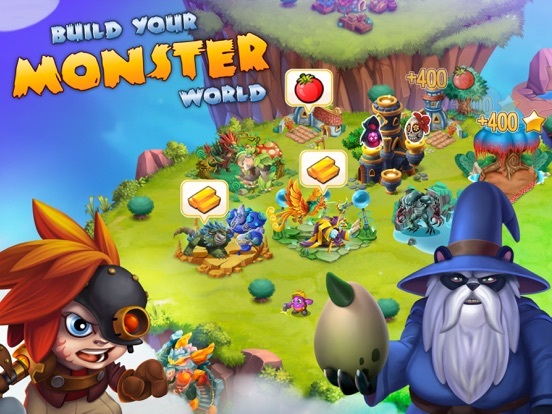 Build a world for your monsters to live, fill it with habitats and breed new species! 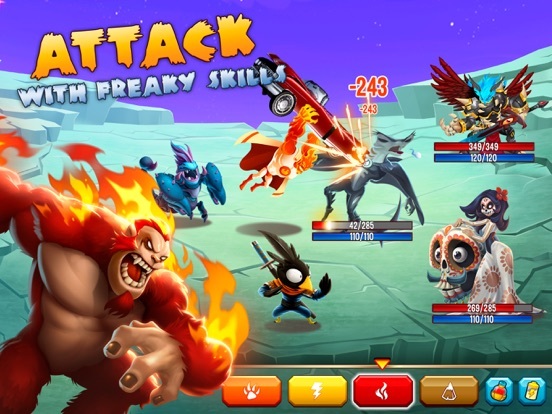 Take your monsters on exciting quests and fighting games full of strategy. Only then will you be able to prove yourself a Monster Master! 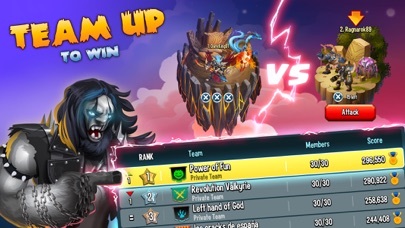 If you’re all about multiplayer games, you’ll love Team Wars, where you’ll be able to duel other Monster Masters and win magnificent rewards and War Coins you can use to collect the exclusive monsters in the Team Shop. Join your friends and connect with a Monster Community of over 60 million players. Start building, collecting and battling today! Monster Legends is a beast of an action game! 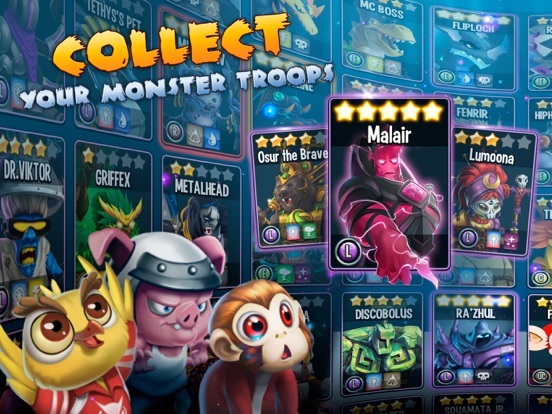 MONSTER LEGENDS FEATURES BREED & COLLECT – UNIQUE MONSTERS AWAIT - Collect over 400 monsters: New monsters are added to the game every week! 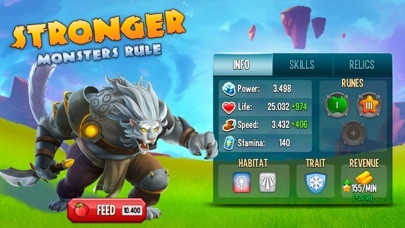 - Breed monsters of different elements and rarities to create cool new species! BATTLE legendary monsters - Collect incredible monsters of all types in limited-time events! - Fight in special events made of wonders and dangers packed with role playing action and unknown monster adversaries. 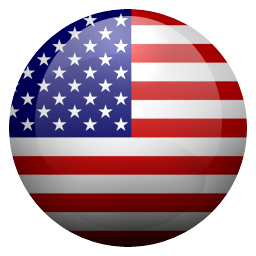 - Collect treasures and rewards in your quest to glory. STRATEGY-BASED RPG FIGHTING GAME - RPG progression to level up your monsters and power them up for the battles ahead. - Your monsters will become stronger as you rank them up in the Monster Lab and equip them with runes! - Set your monster teams strategically, combining the attackers, tanks and effect monsters that work best together - Battle games will require strategy and tactics if you want to rise to the top of the rankings! MULTIPLAYER BATTLES! - Duel other Monster Masters in the PvP Mode, earn trophies and climb up the leaderboards. The higher you are at the end of the season, the better your rewards! - Fight in the Multiplayer Mode each season for trophies, rewards, and a chance to reach the Legendary Leagues and become the Legendary Leader! - The monsters in your Defense Team will need to be strong to protect your trophies from being stolen by other Monster Masters. 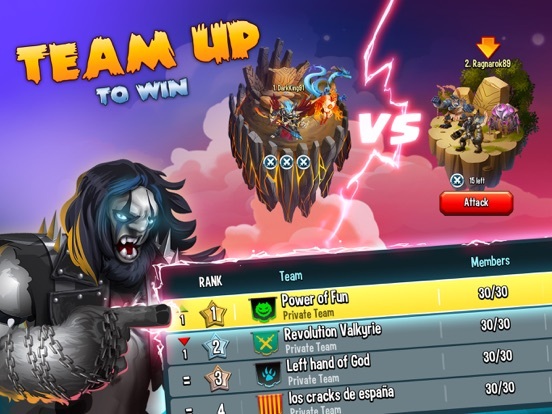 - Team Wars are the ultimate Multiplayer Games: Join or start a team, build a strategy with other players and obtain exclusive monsters from the Team Shop! - Team up with your friends, fight and measure your battle strategy and strength against other players. BUILD A MONSTER PARADISE! - Build a Monster Paradise and fill it with everything you need: A Breeding Mountain, Habitats, Temples, and more! - Unlock special spots in the islands, like the Library, the Temples of the Guardians, and the Monster Lab! Are you brave and skillful enough to fight for your chance to become the #1 Monster Master in the world? 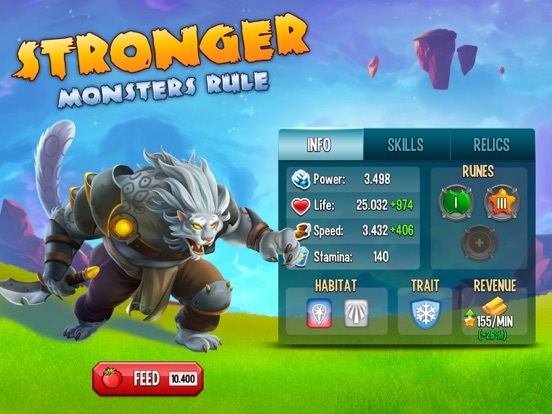 Find out with Monster Legends, the action RPG that will put you in charge of a monster empire! Download today and start training your monsters! 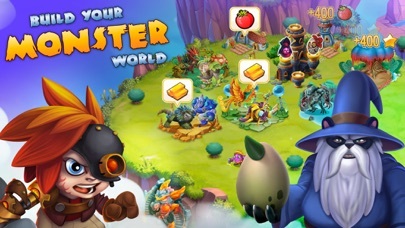 Check Monster Legends out on: Facebook: https://www.facebook.com/MonsterLegends Twitter: https://twitter.com/Monster_Legends Youtube: https://www.youtube.com/MonsterLegendsGame Other great titles by Social Point: Dragon City, World Chef and Dragon Land. Check them out! Monster Legends is FREE to download and FREE to play. However, you can purchase in-app items with real money. If you wish to disable this feature, please turn off the in-app purchases in your phone or tablet’s Settings. If you love your monsters, make them smile. Drop us a nice review here! I love all the little monsters, the only thing I wish is that you could put 3 monsters on one habitat instead of just 2. In my opinion this game is very entertaining, however i do wish there were more ways to acquire gems. Hey your game is awesome if you could get me some gems that would be great thank you from M.J. It's a really fun game and it's really addicting. If you like dragon city you will like this game! I like the game and I can’t stop looking at it. I Played this game every single day but I lost my account. If you can do anything to get my account back I will play your game more. It is fun, easy, and funny. This game makes you wait for absolutely everything. I know this is how they make money, but this can sometimes be very annoying. This is a pretty cool game! I love this SO MUCH YOU SHOULD PLAY IT ITS AMAZING ITS ONE OF MY FAVES!!!!!! This game so fun play. If I’m bored I play this game is good I think everyone should try it. Over all this game is really fun even when I have not bin playing for a long time. I remember when I used to play this game it felt like it was always pay to win but now I think that issue improved a whole lot know. Although I’m here because I want to complain about the latest monsters being added to the game. The new monsters are very good and well rounded but I think they are getting too overpowered. First off, almost every legendary now carries the hardened which I remember was a trait for only monsters that fit it, now it seems like you just throw the hardened trait to every monster now. It even got to the point where monsters start getting the tough trait which was originally only for the war generals. My other complaint is a regular obtainable monster in the game should not outclass a vip monster. An example of this is our newly released monster stake. Stake admittedly is a very powerful monster which I can see usage in competitive. But I don’t see a reason why it should outclass the vip monster for water. When comparing stake and hydrok the forgotten, stake clearly is better in terms of attack, life, speed, and even skills. So I guess where I am trying to go with this is to reduce the amount of monsters with the hardened trait, don’t give the tough trait unless it fits the the monster, and for sure, improve all the vip monsters to make them stand out from the regular legendaries. If you can do that, this game will be completely perfect for me. Thanks for your time. So, I used to play Clash of Clans and when I got this game I thought it was a lot like it, except with monsters. And it’s a great game, just that in multiplayer, there are really no matchups with levels, so really the only thing you can do with you food that is helpful is feed you multiplayer attack and defense teams. That was the first mistake I made. Second, everything in the shop is soooooo expensive! The game charges you two dollars for only twenty five gems, but if you want to buy a good legendary, then you will need to pay over two thousand gems! So this may not be a problem at first because you can breed common, uncommon, rare, epic, and some legendary monsters, but for those unbreedable legendaries, what are you supposed to do? For someone who is not willing to pay real money for in app purchases like me, the only way you can get those legendaries is if you use an event, which in my opinion is really hard. I’ve collected almost all the common, uncommon, rare, and epic monsters and still only have two legendaries, whom I’ve breeded multiple times and still haven’t given me any legendaries! And this may not seem bad but after you get to a certain level, you are able to watch an ad for a gem. It’s ONE gem. How are you supposed to do anything with that!? So overall, I think this is a good game but just don’t think that things are too cheap. This game to me is really great, when I am bored I play it, I check my monsters every hour this was created by Social Point too. To me the games review deserves 4 stars or five, because this game may have issues but the events are no offense, but kind of better than the dragon city one. When I first got this game, one thing I was excited about was the details, the monsters they made, because they all look like something super cool. Same with Dragon city too. Even when there are bugs in the game, I don’t seriously mind much about it, even if it is worst than all the other ones. Ok back to when I got this game, so when getting the game you start with Treezard, a monster that is common in nature process. Instantly I was just so excited to get more other different types of breeds, commons, uncommon, rates, epics, and even legendary, oh there is 0 percent any heroic monsters in this game, ledgendary is the last one, strongest. When you breed the characters like in Dragon City, you get something, but you instead only breed uncommon, rates, epics, ledgendary , but if you get even lucky with the breeding types, you can even get what you got before, like with the slay-en-tar (I forgot how to spell the name) and Pulperism you get a Treezard number 1 monster you start with, just be careful, you can still earn like in Dragon City the same eggs sometimes. So my review is ⭐️⭐️⭐️⭐️. So I’m assuming other people and I love this game. Don’t get me wrong, this game is amazing. My issue is that I got a new phone. Before I turned my old phone in, I made sure (multiple times) that the data transferred. I turned my old phone in and that was that. I slowly stopped playing this game and then came back like the month after I stopped. I logged to find that my everything was gone. I had to start a new. This was very upsetting so I just didn’t bother to play. I was trying to find multiple ways to get my account back. I didn’t have Facebook either so that doesn’t help. There really should be like a Game Center thing we are able to connect to, or even an account for the company, we can create and log on to. I have spent quite a bit of money on this game. I don’t spend money on games I know I’m not going to play long but I was really enjoying this game so I bought bundles and gems. It was really heart breaking to have my progress all gone. If this problem could be resolved I would really, really, really, appreciate it. It would mean so much. Thanks for reading. I’ve never enjoyed a mobile game as much as monster legends. There are so many good things about the game, and there’s constant events and updates. But there’s one thing that personally I find extremely annoying, that is team donating. It is absolutely stupid that you can not donate many cells at a time, I once had 60 voltaik cells and it took me a month and a half in order to get 40 cell donations!!! That’s an absurd amount of time, I think that you should be able to donate whatever quantity of cells at a time you want, whether it’s 1 cell or it’s 40 cells. You could cap this like how you cap elementium so that you need at least 50 cells before someone can donate a large quantity to you. I personally think this would save so much time and speed up the game a bit, because although I understand that you want to balance the game, no one wants to spend a month requesting cells when you should be able to only have to request once. Thank you, I really do hope you add this addition since it will make the gamer more fun for everyone! Keep up the good work as well! I’ve been playing the game just over a month. I really like a lot of aspects of it, fun progression, interesting Monsters, it’s also nice there’s a variety of ways to stay busy so it’s not just 5 minutes and then wait an hour again before you’re recharged to play. My complaint is the customer service. Specifically, I’ve completed a few of the Monsterwood (in game cinema system to watch commercials and earn gems, along with challenges outside the game to earn more, ie.. sign up for a game and get to “X” level and you’ll earn X Gems) challenges and the one that I really expected payout for which was a Gillette razor offer, buy and have shipped a razor package and you’ll receive 2,200 Gems (worth a significant amount in game since Gems are very expensive) and I completed as instructed, waited and nothing was rewarded. I’ve notified customer service several times, no response yet, and still no Gems now a week after completing the instructions. Until this is resolved I will not recommend this game or another product form the developers, it’s too bad they can’t just be the company that finally gets it all right for their customers. I doubt I’ll ever get a response, but if I do, I’ll adjust my review accordingly to the outcome. Okay this game was awesome. Revolutionary even. For the most part, it still is! The monsters are cool, there’s fun combat, it’s all good until you bring up legendary monsters. They are the strongest monsters in the game, so it makes sense that they’d be super rare. Rare to the point where not every single person has one, but not rare to the point where it’s almost impossible to get one without buying gems. I don’t know what happened with you, socialpoint, but it’s gotten to that point. And the worst part isn’t that the game is now pay-to-win, the worst is that you can’t even buy legendaries anymore. I mean you can, if you’re a millionaire and you can afford to spend $500 on gems! The gem offers in the shop are nowhere NEAR worth it anymore! It gets to a point where it’s impossible to progress in adventure mode with just epic monsters, which are still very rare! Seriously. Even with a full team of legendaries, you still would have a very difficult time playing the game. And it’s not a fun type of rare, like if you’re looking for a rare Easter egg or something, it’s the type of rare that makes players get frustrated, check the shop for gem offers, and then quit the game. That is not how you make a fun game, Socialpoint. Do better. Ok ,so I like the game but there are some problems. Getting legendaries from mazes is annoying. The maze take so many coins just to get 1 legendary monster. This leads to a problem because maze coins are RIDICULOUSLY HARD TO COME BY. Island events are annoying because of the lack of time you receive to complete them. I hope you don’t like the last or second to last monster on the island challenge because you have no hope of getting it. The new format of team races COMPLETELY craps on low level clans. Some adds don’t actually give you your reward. The addition of books is aggravating. I just want to use my best monsters social point, is that to much to ask from you? Outside of events most legendary monsters are hard to obtain. These monsters can only be bought for 299 gems if their on sale. Otherwise get ready to spend $100 for one legendary. On the bright side the are some breedable legendaries. Also a BIG problem is the balancing of events towards players of all levels. New players don’t have a chance in hell of getting anything from events without spending money. Honestly this game would be a lot better if it didn’t try to grab my wallet half the time. Great game, Getting a bit greedy Though. I am so addicted to this game but I couldn't give it 5 stars because there are so many bug issues. It kicks me off constantly in the middle of battles and I lose my stamina point, I have a legendary monster that I can't use the special because it glitches EVERY time and kicks me off the game. I tried to email the developer but I have no way to get to the help form because there is an ad in the way that I can't get rid of so I have no way to let the developer know what is going on, it makes me so sad because I am so addicted to this game. I love that you don't have to spend money on diamonds just to compete in the game. I wish you could sell an egg right after you breed it instead of waiting 20 hours or more to hatch before you sell it. It's kind of annoying and a huge waste of time. There should also be a separate mode for moving your habitats around because I find myself moving a habitat or a farm around my map unintentionally even with my little fingers. Or, I can't move something when I want to. Overall, I play this game all day every day, despite the glitches because I am super addicted! Personally, I love this game, there’s people who complain about things such as wait times & other little things. Those are part of this game though and most people realize that. A few things me and other users (from reddit, and a few other sources) are not fans of is the constant push to just buy more and more gems, I know developers need to make money and that should be a part of the game but this game pushes so hard for gem purchases and other in game items such as monsters, cells etc that it does become annoying at times. Events are impossible to rank high in often without constant purchases, most event such as mazes can’t even be completed as f2p at all which I think is crazy, in my opinion people who really really put time into a game should be rewarded for that time and effort, and if the developers reward the player they feel more inclined to purchase things. Anyways, that’s my two cents and if you read this then I hope you take some of the things I’ve said into consideration. Thank you. Love it. But please don’t get it. Very good, but addictive game! Great Game, The Usual Commercialism. So, I’ve been playing this game for about 2 years now. I started playing more, then got interested in other things. I wanna start off by mentioning that this game and good for kids anywhere from 8 years old all the way to teens because of the monsters being not bloody, gory, etc., only because they’re a bit “scary” etc. The game focuses on hatching your monsters, then leveling them up with food that you “cook up” or make in a few minutes, or at higher levels even hours. Then as you level up your monsters, you take them into battles, online, or offline. Also, from what I know, online chatting isn’t present. As with most free mobile games, there is a not very, but noticeable commercialism in this game. (Buying more powerful monsters or items gems that cost real money. I don’t believe this is a pay to win game, as I haven’t spent a cent on it. All in all, very good and fun game all in all. Solid game, will last you months of fun! Hope this review helped kids or parents decide on whether this game if right for them or not! Have fun! DONT EVEN START PLAYING THIS GAME!!! First off this game has so many glitches that take things away from you and when you contact support they act like it's not true. This will make you mad especially when I spend $50 a month just to be an average player. You need to spend a lot of money to get anything. They have mazes where u are supposed to win a monster if u get it to the end, in the beginning it was do-able, now they make it so hard so you buy the maze coins to get the monster. Also the in app purchases they have listed here in App Store is a joke and a fraud. That's not even the right prices, to buy a monster on "sale" mind you you need to buy $20-$30 worth of gems. The ones not on sale you're looking at about $100 if not more. But I'm deleting the game after customer service won't refund you what the game glitches steals from you. Go on the wiki monster legends sites and read the reviews from all the real customers before you spend you're time and money on this game. I don't believe the star ratings on this are factual- it's probably a glitch.😤 Click on the app support next to write a review and see the 22 known glitches in the game to see for yourself. Somehow I bet this will not make it in actual review list. Good but here is the problem.. It gets fun at first, when you first starting. But now I’m level 85, and the only thing that I'm doing is just collecting gold, food and doing the events, the islands get hard without a Timerion, and the dungeons? Really monster legends? Why would you have these rules in them, I like the old times where you can just use whatever monster in the dungeons, the multiplayer is improving considering that you actually get rewards in 1 or 2 weeks. But here is the problem. Heroic Orbs. Those things just completely pact my storage, and the thing is. Heroic Orbs, are completely USELESS. Another thing that is the problem is the events. I’m fine with the Progressing Island and the races. But the mazes. The mazes are so much harder now, you can only get 10% discounts, instead of 30% discounts, also, the good legendarys in the maze are REALLY HARD TO GET! Especially, now maze coins are harder to get, other then those things, it’s a fantastic game! But please, make this game the way it used to be. Great game! Completely addictive! Cost too much! I have a love/hate with this addictive game. They do there best to get gems aka money out of me at all times. And a lot of times they succeed because of my desire to win PvP and have the strongest monsters. There a lot of different things to accomplish in the game, and can be very time consuming until you find the right balance for yourself and how quickly you want to grow. But overall, I am generally pleased with the game. Two asks: 1) Bring back nemesis cell dungeons!!! This was a way for people to get nemesis monsters, who didn’t want to spend a ton of money. I feel it makes the game more balanced when everyone has a chance at slowly but surely getting nemesis cells. 2) Make a repeat last button in rune crafting. If i want to craft the exact same set of runes, why do I have to keep pressing the button over and over (or dragging and dropping over and over). Can’t I just hit repeat last? You made chest opening easier, with the open all/open next buttons, now do the same for rune crafting. This game has really changed a lot during the years. It has become very, very interesting. There is a lot of challenges, goals, events and numerous updates that has taken place. There are new items in the game such as tokens, new improved runes that grant mutations, relics that can give monsters perks before or in battles. And of course new monsters! They’ve also improved the player vs player ranks as well. The icons in the ranks have more awesome looks and can make you seem more intimidating as you reach higher ranks. And lastly; there is the new cave mini game that gives you multiple items as you choose the right door. But you must be careful though, pick the wrong door and you will loose everything unless you continue with gems. I totally recommend this game to those who love monsters, RPGs and those who would love a challenge or to check it out, therefore it has come a long way and can still be really fun to play. I got this game a long time ago. I was a level 39 and I was logged in with Facebook. Then I got a new phone and I downloaded the game again, and the game said this, “it looks like you have already played this game. 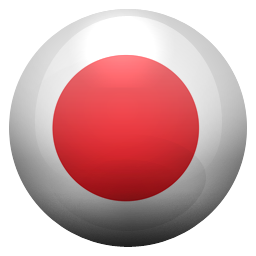 Dot you want to reload your progress, (yes no).” I obviously chose yes and I was back to level 39. But for some reason in was logged in to Facebook so I requested a Facebook login so I could be back where I was in the game “Do you want to login to Facebook,(Yes No).” I choose yes and then it said, “ it looks like you had Facebook login at level 12, “(Which I didn’t). You will reset to level 12. I was al the way back to level 12, and I lost 22 monsters. I was so mad and I tried to reset something or get back to level 39 without going through al the trouble. I deleted and redownloaded the game I reset my phone to the last save, tried everything but nothing worked. So I reported a problem to the company and went to a reset problem. And it said, “we do not have a reset feature. Keep in mind that if you reset your account you can not put it back to your previous state.” Hopefully you read it this far and will not download this game. This game is amazing, one of the few mobile games that’s truly compelling enough and competitive enough to keep me into it for more than a week. Also one of the few games I’ve sunk real life money into, and therein lies the problem. This game is extremely Pay-to-Win, the gap between players who spends hundreds of dollars on this game and those of us that would rather play for free or only put a few bucks in here and there is astronomical. I understand rewarding the players who give you guys money, but making the game excruciating for players who might not have that money to give is extremely unfair. Work on making it easier to get things without spending money, or making it extremely long and drawn out to do anything that doesn’t cost money. My monsters are about 20+ levels under leveled for the area of the map I’m on because I don’t have the gold to level up ALL of my monsters temples AND feed them. Making the game more accessible to Free players would be nice. I love the game, love the challenge, but there’s some things I do not like. Customer service is VERY defensive and will not take blame for errors. I actually had an instance where I purchased something with gems that was labeled 50% off. I confirmed the purchase at 25 gems and I had to be quick because the offer only had around 30 seconds remaining. After purchasing I immediately placed the item onto my land........ Well apparently by the time the item was placed, the sale timer was expired & I was charged full price in gems. This was very discouraging so I emailed the company. In return they told me that particular item was NEVER on sale and it’s impossible for that to have happened. I wasn’t expecting my other half back although that would have been a nice gesture. The company’s focus is on making money, which is understandable, however, they need to come to terms with things that happened and step up to the plate. I could go On but I’m out of time. 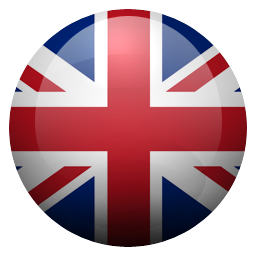 It’s a great app. This always has a new twist into it surely, when I feel bored, my team or the developers bring something new! This honestly is one of my favorite games I play in the car, or at school! It is exactly what I look for, it is very hard to find good games, I truly found a good addicting game here! I really recommend this if anybody would ask, I would say to them:”I recommend the game to people that needs something to do in some just transitions from school, to home, or work to home, or just hang with your pets and play this, turn up the volume though, it’s really soothing!😜”. Thank you, for this game it has really helped me out, when my friends kind of joked about this, it grew my confidence of where I stand, what I do, and how I do it, and I had to face you would be judged, the game has embraced something in me I wouldn’t have found until I was probably in high school. I rate this a 5 for the dedication and hard work in this game! I would like to get my gems that I worked for. Game is great, I played this before for a few years and lost my account. I was quite upset about that as I was putting quite a bit of real money on it. I restarted not long ago because of my daughter wanting to play also. The game has gotten much better since the last time played don’t feel like I have to spend money all the time like before. There is plenty more going on in the game to keep you interested. One problem.... I have been doing a few of the “Hard”game quests to get free gems and, not getting payed my gems. BTW boring as hell games you made me play that lasted longer than a week, because I had to get to lv 10 or something like that. You guys owe me some gems like 1000’s I wanna get paid. So wat up! It’s been 2 weeks since the first 1 and this second 1 for 750 something gems is late a good week. Look me up and pay me out or I will quit playing. I love your game it is my favorite on the market but I have a huge problem with buying things! Every time I make a purchase that’s worth like 20 bucks the game takes my money and doesn’t give me a product! I don’t think I ever would hate on a game like this but it’s driving me insane! I have had to call apple support multiple times to get my money back. If this problem continues I don’t want to play your game much any more. You may think that is not a very big problem but please listen out to this comment it is driving me crazy! I have purchased a pack with voltaik and 2 lvl 10 runes and I have also purchased 300 gems and I never received these items. But if anyone is reading this download the game but if you buy something and it doesn’t come you can agree that they are probably robbing us of our money. (Still love your game though) just please social point give me my products! I don’t want to have to stop this playing this game because I’m losing money. Hmmmm.....the islands aren’t what they seem. I have one other thing to point out. The islands’ outline. Yes. I know. Another “pointless” subject to talk about. Well, actually no it it’s not. I have a problem with the islands’ outline. I do not like the way it is set up because I try to organize my island a certain way but I can’t because the island actually has a limit when it comes to space. Yes. An “island” actually has a limit to space. Which in fact, I think is totally absurd. I mean why does it need to have a limit, also the lines aren’t symmetrical with the other lines. It just doesn’t make any sense. Ugh. Hopefully, this problem can change so that more space can be made on the islands’ rather than being limited. Please, oh please fix this! I would so be happy. I know it’s one person expressing their opinion on a non-important subject but please just take it into consideration. Thanks so much for listening! I hope my constructive feedback will help! Keep it up with this game! It’s starting to actually shine!!!!! In order to be any good at this game it requires you to spend a lot of money! There are monsters that could cost $100. Gems are the main source of currency and that are hard to come by and expensive too should you wish to purchase them. I play for the social aspect of it and it is frustrating because in order to be an asset to the team you need to ether be really high level and also spend money on some monsters or you will struggle. There are some areas in what is called the adventure map that are almost impossible to get through unless again you spend money on monsters or jems to get items to sway the advantage your way. I have play a lot of frustration hard games in my time as a gamer, and this is the probably one of the worst money grabbing game I have ever played. If none of that matters to you and you have a lot of money to spend this is the game for you, or if you don’t want to spend money and like constantly losing in many fights to premium monsters that are often played by computers, or the game creators to push you to buy stuff then this is also the game for you. your game is fun. Easy to understand and play. Fair pvp means yoyr not getting slammed or trying to fight much higher players. having said all that you need to fix a few things. Example: Space Defenders event going on now. It says to “feed, breed and hatch” monsters to get items but it doesn’t always work. i have feed several monsters up to level seven since start of event. that is 4 “feedings” per level. I should be at 28 items under the feed monsters tab for just one of the monsters but I’m only at 14. Is there something wrong? I doubt it but explaining why this isn’t working to my child that also plays is hard. mayve some better instructions. something like “You will get item randomly by feeding your monsters” instead of the current phrasing. Maybe it’s just me. Either way the game is fun and your whole family can play easily. I have played this game for a while. I was there when they switched multiplayer to what there is now. It is a lot harder to find people with the right level you can battle. I have been just getting just level 100 way more often and the refresh the button was removed. Who I fight is probably chooses who I should fight by trophies but it’s gets rarer and my level monster are not that highest levels. I don’t want to spend all of my Gold on food i have a lot of things that need to be upgraded. If you could base the multiplayer on the level of the monsters and the trophies. the multiplayer is a little broken that you can fight the same person more then once in revenge feature on multiplayer can you make it just one or twice you can revenge another player. I like the game and enjoy the challenges, but it's reliance on purchasing gems is a major deterrent. I am not someone who will spend a lot of money buying gems just to make things happen. I have bought a few on occasion, but generally I am patient and just wait until I collect them via other methods. If you have lots of money to blow then go for it. I just don't have it. Edit and update: the more I play this game the more I hate it. I've deleted it twice but my kid talks me into reloading it. Most recently my hate arises from Faunus, Guardian of Farming. I spent days collecting 12.5 million gold to get it. Then 2 more days to have workers repair it. I thought it would be useable then. But noooo, you gotta complete all these challenges of paying gold, food, and runes plus winning numerous PvP battles, but I finally completed all that. At last, I thought I can now use it ... but noooo. Now I got to collect 26.4 million gold to activate it. Seriously. Good grief let me use the blasted thing. Another thing is runes. I battle and spin the wheel and earn runes. I craft them. They are mine and I worked for them. But to change a rune on one of my monsters I have to pay gold for that. Really? They are mine and I should be able to interchange any way I please for free. Ok. I will now delete this game one more time due to its unreasonable requirements. I'm not sure I'll be convinced to load it again. Yeah my main problem with this game is that if you are a HIGH LEVEL....AND I MEAN A HIGH LEVEL YOU SHOULD NOT I REPEAT SHOULD NOT be put against a person who is lower. I looked at my attacked list and see I lost to a player who was level 100 and I am level 29. Like how do the think 120 monsters should be against my 20s that’s total bs. The fact every time I go on the game it has to block the bottom saying “New items in store!” No I don’t care you won’t get any money for me I’m not spending money on this game. Monsters are a ridiculous amount of gems. I do enjoy the free food and such, but I keep my gems for something I need the most for that’s important. And any of those challenges is also fixed to people who are higher levels. Obviously I’m never going to get number one in anything. Make the multi player and the challenges locked to levels. I don’t want to see another person that’s way over my level. I keep seeing in the game to rate the game and havent for pass 2 days since I saw that person in my attacked list. Love the game. Can’t stand the decorations. After clearing an island I wish you could keep trees etc and be able to move them around or purchase them in the decorations sections. I like the natural things that were already on the islands to decorate with. I have some of the other decs and are cool looking but just requesting option for trees &rocks etc New review as of 4/5/19. I like that you continue adding new monsters. Still seems expensive a lot of times. You often have discounts which is good. I wish however there were more breedable legendaries. The ones you have are very hard to breed. I realize the percentage ratio is set lower for legendaries and I like the periods where you have specials but just wish the chance of breeding one was raised a little higher. #2. I don’t like the looks of the legendary habitats coming out. I was going to vote on the survey but didn’t like any of them. I've had multiple experiences that their support should've been able to reconcile, but they are terrible. Don't spend any money on this game because it'll disappear extremely quickly. When I've reported bugs, they don't make any attempts to fix it or make up for it. I've had other people spend my in game currency on my device, but they refuse to give them back. I've also used in game currency to purchase chests that bugged out and they didn't give me the chest or the gems. I've spent gems for a team in a team event, been kicked out of the team before the event was completed, and not gotten any rewards for the event and not gotten my gems back. Also their partners to earn the gems are unreliable. They work with multiple companies and only 1 of them can be trusted to rewards the gems earned, but you often have to wait 1-2 weeks after completion for that company to return as the active reward partner. Overall the company running Monster Legends is very scammy and fails to support their product. You see, I like almost everything about this game. The only problem is that you HAVE to put your one of your legendary monsters in the legendary habitat. What I mean is that I just got my new Metal and Legendary monster done hatching. (The monster is draza) I worked hard to waste 412k gold and waited 24 hours and an additional 2 hours to upgrade my metal habitat to level 2. But when my Draza is done hatching, it LITERALLY SAYS NOT VALID HABITAT. I really hate the way the developers did this because wasting more than 412k gold to upgrade and build metal habitat is just OMG. And I just CANNOT place my monster in the metal habitat. Like I said, the game IS fun with tons of events and new things to try out. But I just hope that the developers change this problem and hopefully, make the legendary habitat more cheaper and not THAT expensive to buy. It could use some improvements. Especially in the multiplayer department. A private chat between two characters is a start. Then also a notification system in the form of an opaque bar at the top of the screen so that Leads and Co-Leads can issue reminders or say something important and it’ll actually stick out (should have a cooldown so it won’t get abused). A green icon next to a players name to indicate that they are online, yellow for online but haven’t done anything in a while, red or blank for not online. Different ranks that can be rewarded in the team besides just giving “Co-Lead” (could use military titles, or maybe knight-esque titles). Maybe small bonuses given to each player based on their title within a team, increasing with a higher rank. Idk those are just some thoughts. Would definitely want a private messaging system before all of that though. This game works amazing on an iPad! I got this game half an hour ago and literally can't get off of it! This game is so addicting and fun! My sister and I LOVE all of the animals, especially their powers when they are fully upgraded! I read the reviews after I got the game and their we're all sorts of complaints about glitches, crashing, and the game getting frozen in the loading screen. This hasn't happened to ANYBODY I know that plays this game on an iPad! I believe that the complaints maybe came from people that played on a computer? Anyway, this game is the best quality, and best working game, on my iPad! I suggest looking at other games made by this company, once you play this one! It's very interesting, and I have absolutely zero. complaints about this game! Have fun, and hopefully, write an awesome review about this awesome game!!!!! Great game but needs improvements. I love this game a lot, it is a very well made RPG, but there are some problems in this game such as: -Getting legendary monsters is ridiculously hard. It takes forever just to get a simple legendary monster, and it doesn't even do much for you -There should be an Ice element. Yeah yeah, some monsters are ice but you give them water, sure that's okay i guess. But having an ice would be way better. -The pvp structure is stupid. You don't get merely anything for winning an attack but, if someone else attacks you, you lose a ton of points. Another thing is that you can't fight people 1v1, online when they're controlling it, not a CPU. -You should be able to friend people without having to log in to Facebook. It is unfair to not let kids friend each other, especially since most of them aren't even ALLOWED to have Facebook. -The last thing is that every monster should be breedable. There are some really cool or funny monsters I've come across, just to realize they are unbreedable. Most monsters cant be accessible without buying it or winning a challenge. It's really stupid to have stuff like this, unless it is limited edition or it is a holiday one. Thank you for listening and please accept my feedback! I have had this game for a long while now like a few years and I have made my own teams like 7 months maybe ago and it's hard to get high level people so I have a bunch of low levels and this is the problem, BARELY ANYBODY PARTICIPATES! I tell them and things but after this team race I'm removing a lot of my people. So do you think maybe you could do something so that teams participate especially in team races because my teams first race was the 2017 Halloween race every since then my team never makes a lap sometimes even so maybe you could even make it a bit different easier so like you don't fail when you're whole team is to blame! I would really like some things changed with this and it would help me a lot. Have a good day and keep doing fun things in the game I hope you consider my problems. I love this game. I mean, it was one of the first games I tried out, and now, I find only a few of other games quite like this one. If you like games that take a long time till you get want, this is the game for you. Also, I have heard about many errors about this game, yet I haven’t seen them, mostly because of the purchases of gems/gold/food, but to the point I am, I don’t need to get purchases. Sure, if you either have the money and/or want to stuff quick, then yeah. The thing is, is that this takes time to get cool stuff. Anyways, I like the game, and the updates to it are cool to, I also like the fact that they made popularMMos into a monster (he was the first youtuber I ever saw). So I encourage this game to improve, and I can’t wait to see what it has in store for us. So I was battling in the Dungeons and it came to a 1v1 with my monster an the enemy monster but t was so unfair, the enemy monster got 2 TURNS after I attacked and I lost to that but it doesn't only happen in the dungeons it happens in the adventure map, and the multiplayer battles which gives players like me such an unfair battle. This even happens when it's the enemies' whole team, my team attacks then theirs go one by one but somehow one or two of the monsters go a second time before my turn to attack. I don't think this is fair AT ALL, even if it were a 1v4 it wouldn't make sense because my team never gets to attack a second time unless their monsters recharge but I don't recharge unless I NEED to. Please fix this it would make the battles a lot easier to do without having to waste gems or gold for items. Well, the title says it all. RPG’s are my favorite besides that Angry Birds RPG game... lol that was so bad lol. Anyway... since my first day, the game was pretty good! I got a few monsters within a day, i played with my friends, SO MANY TOMATOES... but what most interests me is the dungeons and the challenges... I really like them because of how you ragequit because of the monsters who’s lower than you in rank but kicks your ash (yes, ash) in combat. Although it looks great, you, yes you, should know some glitches that may occur. Lol I said glitches but I have only one. xD lol sometimes when you have loaded the game, sometimes you don’t see the dragons. Can you fix this? Also, my cousin’s interested in hacking in all different ways hahahah lol xD. Anyhowwww... play this game! This is amazing and always will be. Bam it was real u scrolled down in my opinion yeyyy. Anyhow, peace. Bye Monster Masters!!! See you in the next rate!